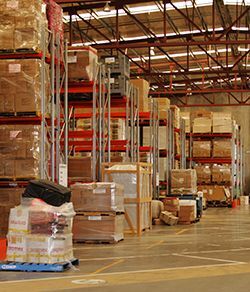 Our own user-friendly warehouse is located with our main office at Brisbane Airport and is ideally situated to complement the international services that we provide. Our staff have the skills to arrange all styles of packaging and labelling and they will competently perform this service. If you would prefer to supervise or assist with this service all of our customers are granted access to our warehouse. We do not restrict our customers from having input into the handling procedures for cargo. Ample hard stand and undercover areas allow us to unpack most type of cargo by using our own forklifts or hire cranes. We have AQIS accreditations in place for most dry products. We have the storage capacity to allow our customers time to collect their cargo and have it delivered to us in advance of consolidation. We have over 3000m2 of warehouse which provides pallet racking capable of holding 1000 pallets plus on ground storage. That‘s ample to suit almost everyone‘s needs.